At my home, I’m using a Raspberry Pi as a watchdog (aptly named “Brutus”) for all kinds of tasks: burglar detection, network intrusion detection, and server monitoring, just to name a few. Still, most of the time, my watchdog hangs around, idling away. That’s not the way I like it, so I’m constantly on the lookout for new jobs that I can assign to Brutus, small or big. In this table, a “2” denotes a double-strike whereas a “1” signifies a single-strike of the bell. The code below is a first draft of my ship’s bell app. It is running as a thread, sleeping most of the time (so you can still call Brutus a lazy dog). When it wakes up, it checks the current local time and determines how many strikes are to be done (‘compute_strikes’). Afterwards, the thread puts itself to rest again. However, I didn’t want to wake it up every second to check the wall time — that would be too inefficient. Instead, I base the sleep time on the temporal distance between now and the next half hour (‘compute_sleep_time’) and sleep for half of this time before checking again. 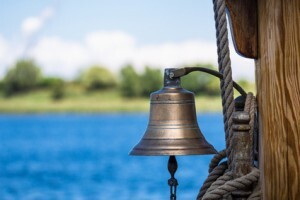 Ship’s Bell app code at GitHub.